President Donald Trump reacted Friday to NFL player demonstrations during the national anthem on Thursday night, saying that "a football game ... is no place to protest" and calling for players who protest to be suspended without pay. In Miami, Dolphins players Kenny Stills and Albert Wilson kneeled behind teammates lined up standing along the sideline. 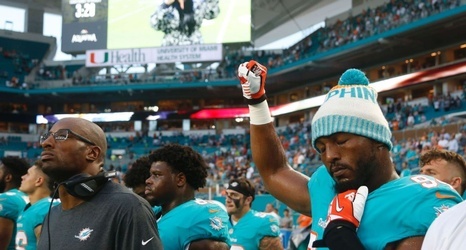 Defensive end Robert Quinn stood and raised his right fist, as he did during the anthem last season while with the Los Angeles Rams. One day after the NFL said it is halting its enforcement of anthem rules, President Donald Trump tweeted out criticism of the NFL and called for action from commissioner Roger Goodell.